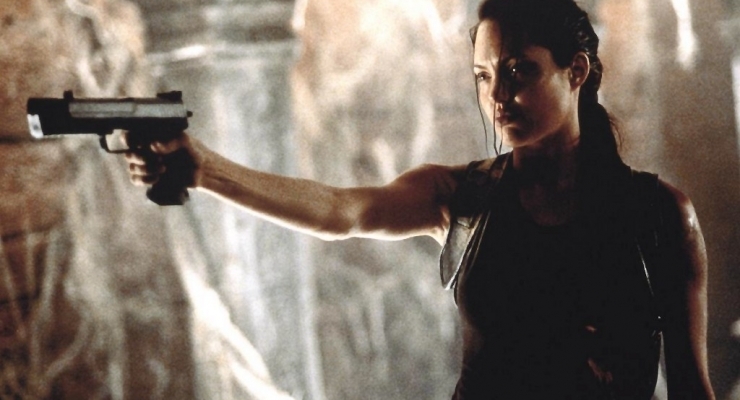 The concept of using video games as a basis for feature-length films was still in its infancy when Lara Croft: Tomb Raider hit the big screen in 2001. This action-packed film opens in an Egyptian tomb with Lara Croft (Angelina Jolie) disabling a huge robot programmed by tech-wizard Bryce Turing (Noah Taylor). The scene shifts to Venice where the secret Illuminati society plan to find both halves of the Triangle of Light, joining them when the planets align, and gaining control over time itself. Manfred Powell (Iain Glen), an Illuminati leader, assures the group he is hot on the Triangle’s trail but he really has no clue where it is. Lara envisions her late father Lord Richard (Jon Voight) in a dream where she learns about the Triangle of Light. She finds a clock with a strange device hidden in Croft Manor. A consultation with Wilson (Leslie Philips), an antique clock expert, gets her involved with Powell and her one-time boy friend, tomb raider Alex West (Daniel Craig). After Powell’s men raid her house and steal the clock, Lara finds a letter from her father drawing her into the chase for the Triangle so she can destroy it before the Illuminati use it for their evil purposes. A trek to Cambodia yields half of the Triangle that is quickly expropriated by Powell and West. The uneasy alliance of Powell, West, and Croft travel to Siberia to find the Triangle’s other half before the planetary alignment is completed. This becomes a true race against time that threatens everyone’s life and challenges the boundaries of the space-time continuum. Lara Croft: Tomb Raider was one of director Simon West’s first films and he got a nonstop script from the writing team of Patrick Massett and John Zinman. Jolie is a badass adventurer with a refined British accent who , incidentally, did many of her own stunts. Her villainous counterpart Iain Glen is a sly and smarmy bloke. The shots by veteran cinematographer Peter Menzies, Jr. set a hell-for-leather pace that does not let up until the end. While savaged by the critics at its cinematic debut, LCTR plays and replays awfully well on the small screen, particularly in its new 4K UHD incarnation. Panavision Panaflex Platinum and Milennium XL cameras with Primo series lenses produced the original 35 mm sources for Lara Croft: Tomb Raider. The HEVC 2160p (4K) remastered version yields a stunning makeover, eliminating much of the grain present in the original film. The Dolby Vision encodement shows impressive advantages in details, blacks, and color palette. Compared to the original 2006 Blu-ray, on hand for comparison, the set’s new Blu-ray disc is also much improved. 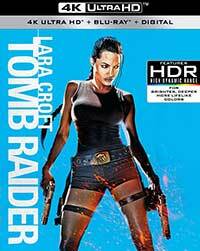 I was a bit disappointed that we are “only” given a DTS-HD Master Audio 5.1 soundtrack for this release of Lara Croft: Tomb Raider, but my disappointment vanished on hearing this highly immersive audio with great support for the special sound effects that enhanced the exciting onscreen action. The UHD disc contains voice commentary by director Simon West. Digging Into Tomb Raider (English Dolby Digital Stereo 48kHz/16-bit) (25:27): A featurette about translating a video game into big-screen reality. Crafting Lora Croft (English Dolby Digital Stereo 48kHz/16-bit) (6:49): The physical transformation of Angelina Jolie into a fit fighting machine. Visual Effects of Tomb Raider (English Dolby Digital Stereo 48kHz/16-bit) (20:19): The creation of the stunning props used in the film. Tomb Raider Stunts (English Dolby Digital Stereo 48kHz/16-bit) (9:28): The various special stunts like Lara’s bungee ballet and fight sequences. Are You Game? : (English Dolby Digital Stereo 48kHz/16-bit) (8:00): Selected sequences from the video game. Rounding out the supplements is an UltraViolet HD download available from iTunes. This film remains one of my guilty pleasures even though I have never played the video game. LCTR made a bold and enduring statement for strong women leads in the action film genre and, in its 4K makeover, the latest edition of LCTR should be very hard to resist. The video game icon is brought to life by Angelina Jolie in this 2001 original big screen adaptation that finds the heroine doing what she does best -- tracking down ancient artifacts and fighting off villains to get the job done. An excellent makeover of a classic video game that became a monster film hit and featuring one of the very first strong female action leads of the new millennium.